1. In recent decades, changes in climate have caused impacts on natural and human systems on all continents and across the oceans. 2. In many regions, changing precipitation or melting snow and ice are altering hydrological systems, affecting water resources in terms of quantity and quality. Glaciers continue to shrink almost worldwide due to climate change affecting runoff and water resources. 4. 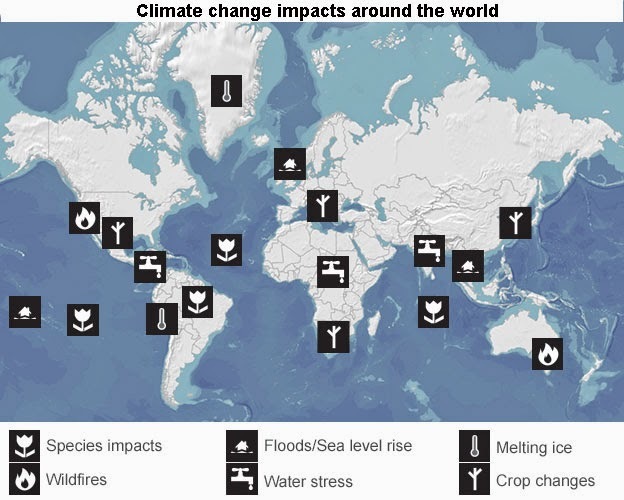 Impacts from recent climate-related extremes, such as heat waves, droughts, floods, cyclones, and wildfires, reveal significant vulnerability and exposure of some ecosystems and many human systems to current climate variability. 5. Climate-related hazards exacerbate other stressors, often with negative outcomes for livelihoods, especially for people living in poverty .Climate-related hazards affect poor people’s lives directly through impacts on livelihoods, reductions in crop yields, or destruction of homes and indirectly through, for example, increased food prices and food insecurity. 6. Adaptation is becoming embedded in some planning processes, with more limited implementation of responses. 7. Adaptation experience is accumulating across regions in the public and private sector and within communities. Governments at various levels are starting to develop adaptation plans and policies and to integrate climate-change considerations into broader development plans.